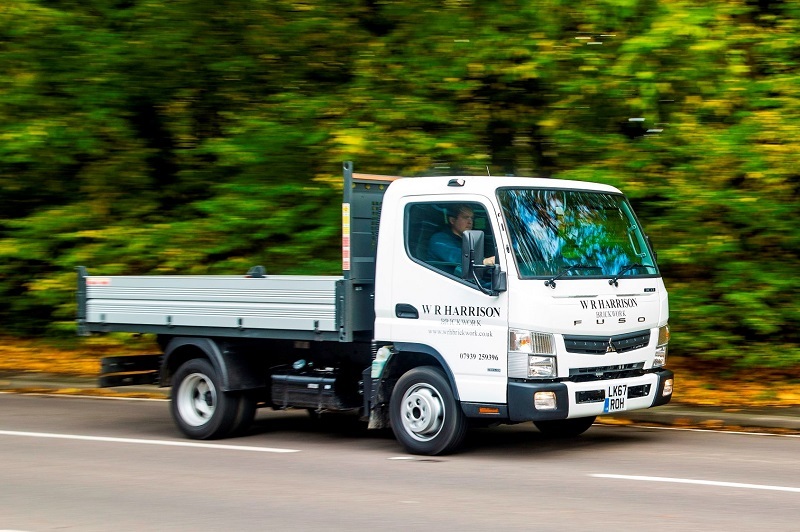 Building contractor WR Harrison Brickwork has become one of the first UK customers for a new range of pre-bodied FUSO Canter light trucks supplied direct from the factory. 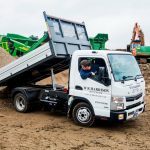 The Mercedes-Benz Dealer Network, which is also responsible for sales and support of the popular Canter in Britain, is now offering ready-to-work 3.5-tonne platform dropsiders and tippers fabricated in a combination of alloy and steel, and 7.5-tonne tippers in steel. Bodywork by the highly regarded Italian manufacturer Scattolini is being fitted at FUSO’s main European production facility in Tramagal, Portugal. The new programme allows customers to put their new vehicles to work a lot more quickly than would be the case if chassis were sent to third-party bodybuilders. Finished trucks are also covered by single invoices, simplifying administration and reducing associated costs. For more Builders Wheels click here, here and here. WR Harrison Brickwork, which is based in Hoddesdon, Hertfordshire, acquired its 3.5-tonne Canter 3C13 from local Dealer S & B Commercials. The subject of a flexible, low-cost Agility funding agreement from Mercedes-Benz Financial Services, it has a Comfort day cab and an alloy, rear-end tipping body – three-way tippers are also available for both 3.5- and 7.5-tonne variants. Fuel-efficient and exceptionally manoeuvrable, the smaller Canter shares its larger stablemate’s ladder-frame chassis, which also gives it the strength and durability of a ‘proper’ truck. Given that most of its competitors in the 3.5-tonne GVW segment have van-based underpinnings, these qualities are making the Canter an increasingly popular choice for builders and others in associated trades who value toughness and reliability in a vehicle above all else. An experienced and trusted contractor, WR Harrison undertakes a wide range of commercial and residential construction projects, and provides property maintenance services. The company – which employs a team of seven – works throughout Hertfordshire, and within and around the M25. WR Harrison’s new workhorse is powered by a high-torque 3.0-litre engine producing 130 hp and paired with a five-speed manual transmission – 3.5-tonne Canter variants are also available with a 150 hp version of the same engine, and with the twin-clutch DUONIC automated transmission.